On May 20th, 2012 an Partial Eclipse will cover the USA, Mexico, and half of the World. which is "the day" the Pleiades, the Sun, and the Earth are "joined" together. and the Pleiades, the Sun, and the Earth are "JOINED" TOGETHER at this time. 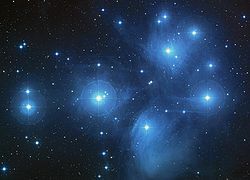 כּימה is the Pleiades, a constellation consisting of seven stars. The Crop Circle predicts the eclipse and references the 16 days later/Transit in front of Sun = June 6th, 2012. The Crop Circle indicates that something very Significant will occur re May 20th, 2012 and June 6, 2012. This all coincides with the repeating 52 years when the Sacred and Solar calendars coincide on the same date!